It happened several years ago while at the Mansfield, Indiana Mushroom Festival. A man walked up and inspected our display of mushroom items for sale. After a few minutes he stated, "I've got the biggest morel you've ever seen." Being in the business we're in, we always hear mushroom stories and are sometimes skeptical of wild claims such as the one this gentleman was making. And, besides that, we've seen some pretty big morels. I'm sure my response was something similar to, "Really? Where's it at?". He said he'd be right back. After a few minutes he returned with who I guessed to be his wife and two daughters. He said, "Well, what do you think?" Being a bit puzzled, I asked him where the big morel was. He leaned down to the older of his daughters and said, "Tell the man your name." She ever so sweetly said, "Morel." Amazed, I asked her to repeat that. And again she said her name was "Morel". I was struck numb. My first reaction was to call my own daughter, Katie, on the walkie-talkie. I wanted to introduce her to this man, and his family, so she could witness for herself that there just might be someone out there that is crazier about morels than I am. Katie is the youngest of our five children. She was only three years old when we started our company, Morel Mania, and was ten when it became my full-time occupation. She probably doesn't remember life before mushrooms. I'm sure she gets weary of all the phone calls, mushroom discussions, and morel related activity at our house. Our middle daughter, Tomi, recently went away to college. When her roommate asked her what line of work her father was in. Rather than try to explain it, Tomi told her to just do a Google search for "Tom Nauman" on the internet, which would explain it all. While I was trying to reach Katie, the man said, "Wait", and he again leaned down to his daughter and said, "Tell him your middle name". To which she responded, "Hunter". Wow! A beautiful young lady, who I guessed to be about four years old, and her name was, Morel Hunter! At this point I was in awe. Katie showed up about that time and, after hearing this story, was relieved that I hadn't met this family before she was born because she knew her name probably wouldn't be "Katie". She was correct because I was already asking myself, "Why didn't I think of that." Although my wife, Vicky, might have had the final say in the matter. I'm sure Vicky sometimes tires of my fanaticism also. 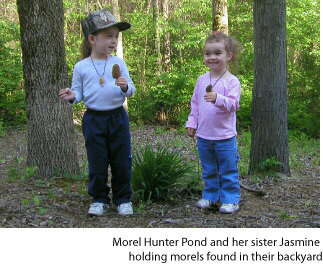 The young lady was from Ohio and her full name truly is "Morel Hunter Pond". I'm sure at times in her life her name will seem like a burden. But not when she's around me and people like me that share a passion for morel mushrooms. We think we are morel hunters. This young lady literally has the title. And if the Pond family ever makes it to our festival in Henry, Illinois, Morel Hunter Pond will be our honored guest and will also be designated "Princess of the Festival". Her dad, Kirk, will have to give me advanced notice so we can get the royal tiara and cape made because I don't know of any stores that carry a cape suitable for royalty made of camouflage material. In other mushroom news, The first morels of the year were reported to the Sightings Page - http://www.morelmania.com/6Sightings/index.html - on January 5 near San Diego, California. In Illinois, Joe McFarland reported black morels found in Jackson County on March 14. The Illinois State Morel Mushroom Hunting Championship and Festival will be held at the Marshall-Putnam Fairgrounds near Henry, Illinois. The Festival will begin on Friday evening, May 5 with an open house, a discussion of mushrooming, mushroom cooking demonstrations, a craft show, and free samples of cream of morel soup. Then on Saturday May 6, a maximum of 527 mushroom hunters will be transported by bus to a leased hunting area and will be allowed two hours to gather as many morel mushrooms as possible. Winners in several categories receive trophies and prizes. One more note of interest is that after several years of my prodding him, my brother, Dave, has finally assembled a morel cookbook. While I get the most enjoyment in finding morels, Dave finds more gratification in consuming them. And he's not content with simply “frying ‘em in butter”. "Morel Mushroom Recipes - Favorites From The Nauman Family & Friends" contains 28 recipes that don't require exotic ingredients other than morels. Some are old family favorites, some are his own creations, and others are from dear friends of our extended family. The new book sells for $4.95 (includes sales tax) plus $1.00 postage from Morel Mania or visit us at the festival in Henry. Whenever you want to try eating a mushroom you're not familiar with, check it in at least two field guides. If they say it's edible, try just a nibble, wait 24 hours, and if there are no ill effects then consume larger amounts. All past articles are available at http://www.morelmania.com/5Mushrooms/index.html. Please feel free to contact us with questions or comments. Especially if you have ideas or suggestions for future columns: Tom and Vicky Nauman, Morel Mania, 8948 Illinois Highway 18, Magnolia, IL 61336, Phone 309-364-3319, Fax 309-364-2960, tom@MorelMania.com.